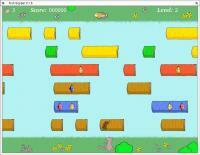 Description: An OpenGl game loosely based on Frogger. at the top of each source code file and also the file COPYING for details. 'make uninstall' so you'll have to delete them manually. across a magical network of rivers with coloured logs floating on them. On the far side of each river is a tasty fish supper. he can always land on, and white crystals, with which he can land on any log. get it back if it's one he needs, though. 'power-ups' to help him on his way. you'd expect. Any button can be used to make Albert jump. space bar makes him jump. The levels follow the same pattern each time you play. always press [Esc] to pause the animation as well. into the water as soon as you try to move. Next to that is the score (labelled... Score!). Next to that is the current level. Bottom-left are the crystals that you're currently holding. Changes are written to your "config.txt" file when the program quits. to 10 letters ('a'-'z', small and captial) and digits (0-9) are allowed. your name will be "anon". It also uses SDL_image and SDL_mixer. for FreeBSD Port and for advice on portability (dotdir, etc.). for including my game on their website. Thank you for downloading and playing Fish Supper!